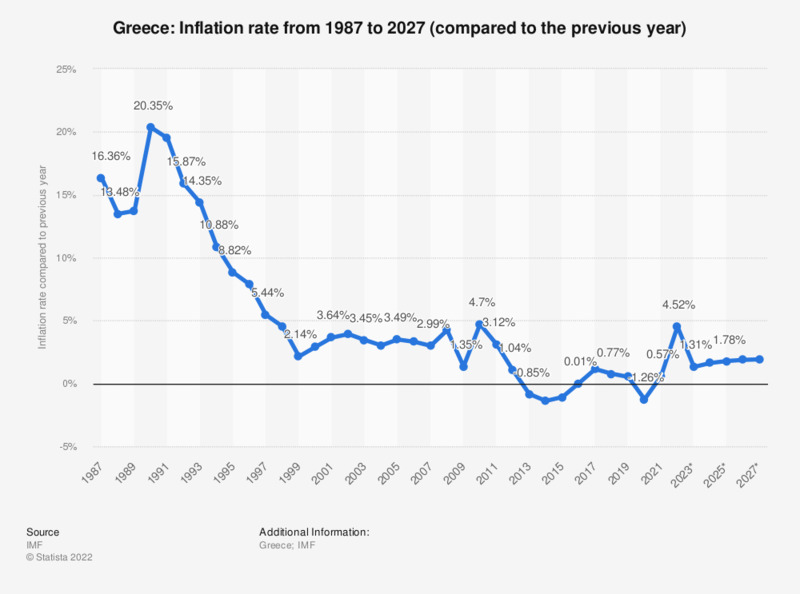 The statistic shows the inflation rate in Greece from 2012 to 2017, with projections up until 2022. The inflation rate is calculated using the price increase of a defined product basket. This product basket contains products and services, on which the average consumer spends money throughout the year. They include expenses for groceries, clothes, rent, power, telecommunications, recreational activities and raw materials (e.g. gas, oil), as well as federal fees and taxes. In 2017, the average inflation rate in Greece was at 1.14 percent compared to the previous year. For comparison, inflation in India amounted to 9.44 percent that same year. Everything On "Economic Outlook Greece" in One Document: Edited and Divided into Handy Chapters. Including Detailed References.